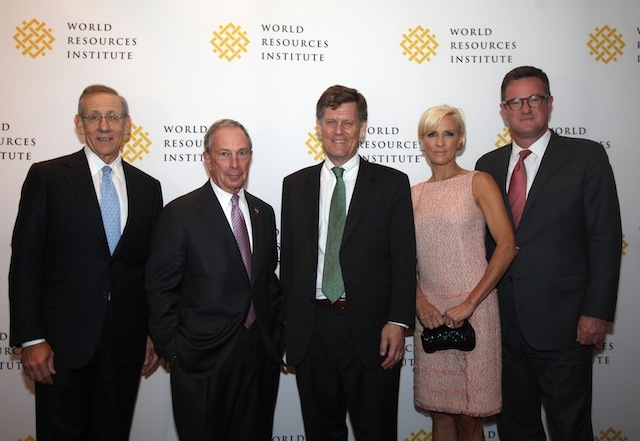 Left to right: Stephen Ross, Mayor Michael Bloomberg, Jonathan Lash, Mika Brzezinski, Joe Scarborough. Photo by Hechler Photographers. This post was originally published on WRI Insights. Cities were a major theme of WRI’s 30th anniversary dinner last night. And, why not? The event took place in arguably the greatest city in the world, New York. Guests included Mayor Michael Bloomberg; real estate developer, Stephen Ross; former Deputy Mayor and current President of Bloomberg, Dan Doctoroff; and many more. It was an elegant, high-energy dinner, as 350 leaders in business, government, and philanthropies gathered in the ballroom of the Mandarin Oriental Hotel, overlooking Columbus Circle. Joe Scarborough and Mika Brzezinski of MSNBC’s Morning Joekicked things off with their typical banter, exchanging barbs about their bi-partisan relationship and the New York Rangers playoff game (sadly, they lost 5-3). 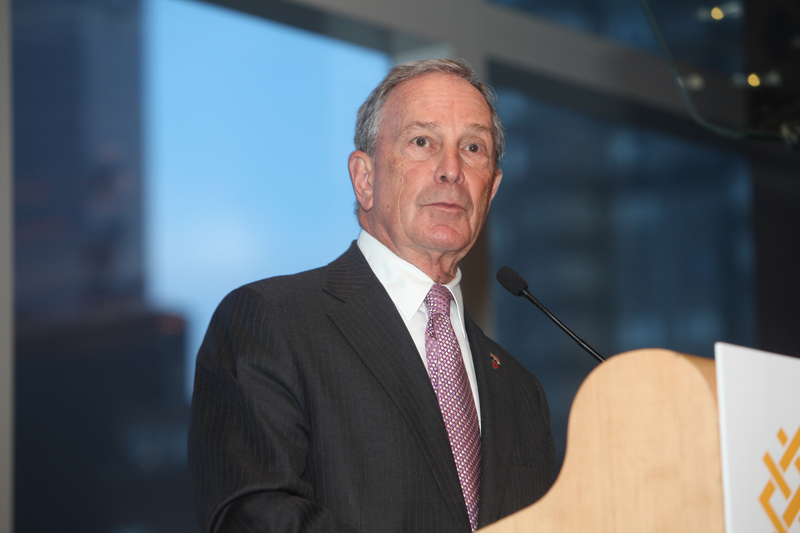 Mayor Bloomberg was the evening’s featured speaker. While I’ve seen the Mayor speak in the past, I was truly blown away by his remarks. It’s amazing that after 11 years of serving as Mayor and giving countless speeches, he can still bring such passion to his job. Michael Beschloss, a preeminent author and historian, introduced Mayor Bloomberg, calling him a “transforming leader.” He described the Mayor’s remarkable accomplishments across a range of sectors, including his “moving forcefully” to advance environmental and sustainability in New York and beyond. NYC Mayor Michael Bloomberg was the event’s featured speaker. Photo by Hechler Photographers. The Mayor is putting action behind these words. In addition to his work in New York, Mayor Bloomberg leads the C40, a global network of city officials working to address climate change. WRI recently teamed up with C40 and the group ICLEI-Local Governments for Sustainability to develop new, city-level greenhouse gas accounting standards that will help localities measure and reduce their emissions. Additionally, Bloomberg Philanthropies has been one of WRI’s biggest supporters when it comes to urban issues and transport. They provide significant funding to EMBARQ, WRI’s center for sustainable transport, which is improving the quality of life for millions of people in cities by reducing pollution, enhancing public transportation, and addressing health and road safety issues. Stephen Ross: Forging a New Path on Cities. This can be seen in Related Companies forward-thinking approach, including its being one the first developers to build residential LEED-certified buildings, incorporating efficiency and recycling throughout its projects, and, most recently, in transforming Hudson Yards. Of course, the event wasn’t all about cities. WRI also honored its former president Jonathan Lash, who is now training the next generation of leaders as president of Hampshire College. Jim Harmon, chairman of WRI’s board, noted Lash’s humility and inclusiveness as keys to his unique leadership style. Harmon reflected on Lash’s legacy of deepening WRI’s engagement with business, expanding our global presence, and helping re-define environmentalism.Lash expressed his appreciation, and he seems to be truly enjoying his new role among students (and cows) in rural Massachusetts. To close the event, WRI introduced our incoming president, Andrew Steer. Steer engaged the audience with his energy and outlined the challenges ahead. He reminded us that the world has seen considerable achievements over the past 20 years, especially in terms of bringing people out of poverty. Yet, as the global population expands—with more people gaining access to electricity and consumption levels rising—pressure on resources will mount. “We have a real prospect in the next 20 years of addressing these problems,” Steer said, but we need leadership and ideas to make this happen. Hopefully, we can all rise to this challenge. Overall, it was an engaging and lively event. A group of WRI staff hung around afterwards, chatting and relaxing well into the night. And, why not? What else would you do in one of the greatest cities in the world? View additional photos and video from WRI’s 30th anniversary dinner. And be sure to check out our interactive timeline.